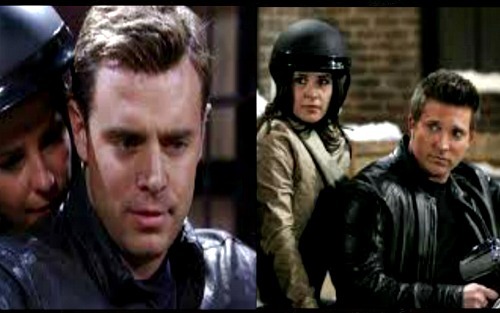 General Hospital (GH) spoilers tease that the Jason (Billy Miller) saga will continue to unfold. This storyline is already heating up and things are only going to get hotter from here! Patient Six (Steve Burton) will eventually make his way to Port Charles, but how will that affect Sam’s (Kelly Monaco) love life? GH viewers can’t seem to agree on who should be the real Jason Morgan. An all-out war is going on! First, let’s talk about Billy Miller. Many General Hospital watchers have grown to love his version of Jason. Miller gives the role a softer touch and has great chemistry with Kelly Monaco. We’ve also have a chance to watch Miller’s Jason turn into who he is now. It’s been a long journey, but everything we thought to be true is in jeopardy. Some General Hospital fans may feel cheated if Miller is revealed as Drew. Other GH fans would argue that Steve Burton is Jason and that’s that. He held down the role for two decades, so it’s understandable that many people want him to play his old character. General Hospital has the opportunity to bring Jason’s edge back with Burton. It could inject some excitement into the show. There are even some viewers who love both Miller and Burton. If you’re a “JaSam” fan no matter what, this decision is particularly tough. Old “JaSam” and new “JaSam” both seem like appealing options. Sam may find herself in the same boat once Burton’s character arrives. She adores her current husband, but what happens once the man with Jason’s old face appears? Difficult choices are in Sam’s future. Sam will undoubtedly need some answers before she turns her life upside down. She can’t just take Patient Six’s word for it. Even if Sam is given real proof that Burton is Jason, she could still be torn. Sam can’t just shut off her feelings for Miller’s Jason. At the same time, how can she not be drawn to Burton’s version? General Hospital spoilers say Sam has quite a challenge ahead of her! What do you think Sam will decide to do? Will she leave Billy Miller’s Jason for Steve Burton’s Patient Six? Vote in our GH poll! We’ll give you updates as other news comes in. Stay tuned to the ABC soap and don’t forget to check CDL often for the latest General Hospital spoilers, updates and news. Will Sam Leave Billy Miller’s Character (Drew or Jason?) For Steve Burton’s Patient Six?